Obstacle course races have grown in popularity. Pretty much non-existent a decade ago, about four million people will take part in some type of mud run by year's end. Still, it takes a certain kind of person to sign up for such a race with all the walls, running, wild obstacles and, of course, mud, involved. AJP Training took a nine-member team to the Half Mudder on June 12, most competing in their first obstacle race. I left the five-mile course in Doswell, Va., very proud of each member. (It didn't hurt we had the best shirts on the course.) We stuck together, competed hard and finished as a group. Lori has trained at AJPT either on her own or with her husband, Eddie, for about a year. (Eddie also was part of Team AJPT.) She's a black belt in Krav Maga, but admittedly not a runner. 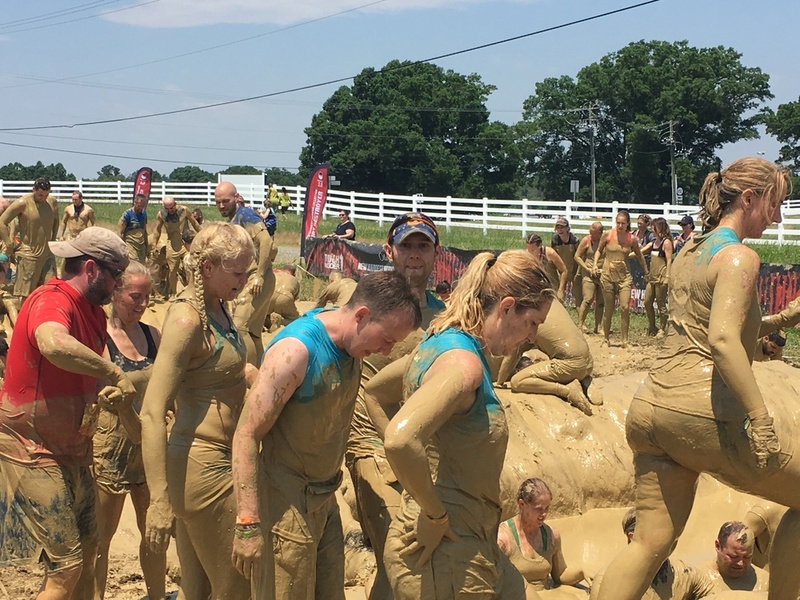 "I am so happy I decided to do the Half Mudder -- even though I'm still sore from it," Lori said. "I wanted to do it because it looked like a fun challenge. I had never done anything like this before, and it gave me motivation to train and get myself into better shape. My biggest fear going in was that I wasn't going to be able to run the whole thing or finish an obstacle." This was my 11th Tough Mudder event overall, although this was the first time I've run as a team. I told everybody we would have to stick together and help one another, no matter what. Really, that mini-speech wasn't needed. Everybody worked as a group perfectly. "The obstacles are not only about doing them, but helping the person behind you," Loris said. "My favorite part was the team atmosphere that the event had. Everyone was really there to have fun and help each other out. It wasn't a race and it wasn't about finishing first, it was about finishing together, which we did. I'm going to keep training (once I stop being sore from this one), and try to do another event soon!" At 16, Elizabeth was our youngest team member. She began training at AJPT last year and has since joined her high school crew team, but this was her first race of any kind outside of a 5K in elementary school. You kind of know what to expect in a typical 5k: You just run. It's a little different when there are 12 obstacles laid out ahead of you. "I'm not a very big 'wait for the unknown' type of person. So running a course that you don't even know what's waiting for you just around the corner was nerve racking for me," Elizabeth said. "After building my confidence in the first few obstacles with my team, I felt I could accomplish anything." You could see the trepidation turn to pure confidence as we progressed through the course. "Eventually, during the run, I realized that sometimes not knowing is only half fun," Elizabeth said. "Every obstacle that my team and I came across was nothing short of exhilarating. To sum it up, completing my first Tough Mudder was a huge accomplishment for me." It took some convincing for Hugo, another longtime AJPT client, to warm up to the idea of running the Half Mudder. "I definitely overcame a non-rational fear of running," Hugo said. " I loved the obstacles, any excuse to act like a monkey and I'm happy." But it wasn't the obstacles like Everest 2.0 (where we had to run up a quarter-pipe) or the Berlin Walls (8-foot walls we scaled) that sticks out most in Hugo's mind. It was a conversation with his husband (and AJPT client) Joel afterward. "The moment I remember most is when Joel told me he was proud of me," Hugo said.